When researchers begin to dig into the past, they often find information about ancestors that is somewhat controversial. Common held opinions of our ancestor Benjamin Barefoot repute him to be a doctor. 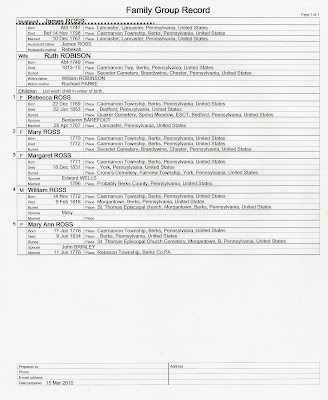 Two family researchers, Sharon Sheldon and Becky Barefoot, have checked with every medical institution in existence at the time that Benjamin lived, and he is not listed as a student in any of the medical schools of the time. Other people claim that Benjamin is buried in Lancaster County, PA, but researchers have discovered that his burial is not recorded in the Leacock Cemetery. So the investigation into the life of Benjamin Barefoot has taken another turn. What researchers did discover is a very different scenario from the commomly held beliefs about our ancestor. Benjamin Barefoot was born about 1764 to Samuel and Jean (Palmer)Barefoot in Chester County, Pennsylvania. He was born into a family of blacksmiths. On 28 April 1787 he married Rebecca Ross in Lancaster, Pennsylvania. Rebecca was born 22 December 1769 in Caernarvon Township, Berks, Pennsylvania, United States, the daughter of James Ross and Ruth (Robinson) Ross. In 1788 they began their family with the birth of their first son James. Note: The birth date of child #2, Mary Ross, is conjecture. Her tombstone provides information that she was two years old. She is buried next to her mother Ruth Robi(n)son in the Seceder Cemetery, Brandywine, Chester County, Pennsylvania. Near the turn of the 19th century, our ancestor Benjamin Barefoot, whose occupation is recorded as a blacksmith, and who was living in Caernarvon Township, Berks, Pennsylvania, allegedly found himself in legal trouble. These difficulties must have eventually prompted him to leave his wife Rebecca (Ross) Barefoot and their 5 children behind in the care of her widowed mother Ruth Ross and her brother William as Benjamin fled to Fayette County, Pennsylvania. But first, let's take a look at some of the documents that exist on Benjamin. As a blacksmith, Benjamin would have needed iron. As he approached the end of the 18th century, Benjamin Barefoot is being sued by a local iron master because he had failed to pay his bill. Document 1 - Benjamin Barefoot is summoned by the Justice of the Peace Amos Slaymaker on behalf of iron master James Buckley because Benjamin is accused of non-payment of a debt. Year 1796. From the above summons, one would conclude that Benjamin was not a doctor but that he had continued in his family's trade, which was that of blacksmith as substantiated by the fact that he had purchased iron on credit and had not paid for it in a timely manner. At this point his business must have been neglected or failing. Unfortunately, Benjamin has not left enough information behind for us to enumerate his good traits. We know that he was father of five children to Rebecca. For most of his marriage, one would assume that he successfully conducted business and was a respectable community citizen who attended church, as we find a record of his presence at his child's baptism at St. Gabriel's. We also know that he and Rebecca were together as man and wife until 1797. But that is the point at which things seemed to go awry. The scanty pieces of paper that exist concerning Benjamin paint a sadder picture of our ancestor whom we esteem so highly as "Dr." Benjamin Barefoot. Besides the unpaid iron bill, we learn that Benjamin found himself in worse trouble than unpaid bills. In the records of Governor Thomas Mifflin, our sleuth Sharon Sheldon has found a very incriminating document. Benjamin was in legal trouble for fornication and bastardy. With a fifth child on the way or recently born to his wife Rebecca, Benjamin's indiscretions must have been quite an embarrassment to the family and a heartache to his wife. 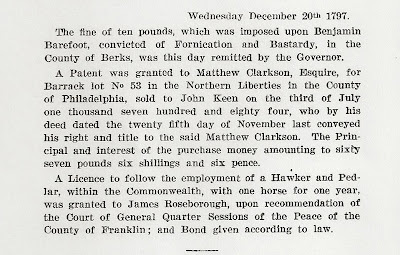 Document 2 - From the records of Governor Thomas Mifflin, p. 1320, Benjamin Barefoot is accused of bastardy on 20 December 1797 and has remitted the fee. The conviction of bastardy (suggesting that he fathered a child out of wedlock) coincides with the birth of his son Job Palmer M. Barefoot to Rebecca Ross Barefoot on 27 May 1798. These documents solve that mystery of Benjamin's departure and give us reason to surmise why Benjamin decided to leave Berks County without his family. We are not certain when Benjamin left, but we know that he was still in Berks County on the 2 July 1797. We are not positive that he was present at the birth of his last child Job Palmer Barefoot on 27 May 1798. With the revelation of Benjamin's indiscretions with another woman along with his unpaid bills, Rebecca certainly must have been extremely unhappy with her husband's behavior. Record 3 - Here is a baptism record that shows Benjamin as the father of this child who is being baptized. The child is identified by researchers as his son William at St. Gabriel's Church, Amity Township, Berks County, Pennsylvania. Why did he go to Fayette County? Perhaps Benjamin needed to find gainful employment in an area where metal was readily available. One can only speculate why he headed to Western Pennsylvania, but it seems obvious that he might have wanted to leave his troubles behind or that Rebecca Ross Barefoot simply had had enough. By 1800 Benjamin Barefoot was listed on the Fayette County, Pennsylvania,Census living alone. He seemed to have a propensity for getting involved in legal trouble. In Fayette County, Benjamin was involved in another lawsuit, but this time it was initiated by him. He was involved in a dispute with one Archibald Coone, which was resolved out of court. These are the last concrete references to Benjamin. 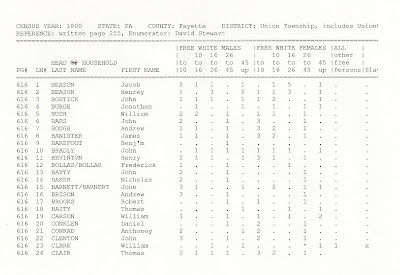 Document 4 - 1800 Census of Union Township, Fayette County, Pennsylvania, showing Benjamin Barefoot as a resident with no family. Even in Fayette County, life was not rosey for Benjamin Barefoot, as one family researcher - Sharon Sheldon - has discovered. Benjamin Barefoot in Fayette Co. In June 1800 Benjamin (Barefoot) had filed suit in Fayette County against Archibald Cooney, who apparently has damaged property of Benjamin’s. The judge sets the date for September 1800, which implies that Benjamin wasn’t just passing through. However, two weeks later, Benjamin pens a very nice note to the judge, telling him that he and Archibald Cooney have settled their differences, and “could you not serve the writ.” This letter marks the last-known documented proof of Benjamin Barefoot. Fayette County: The Commonwealth of Pennsylvania to the Sheriff of Fayette County greeting. We command that you take Archibald Cooney late of your county yeoman if he be found in your bailwick and him justly keep so that you have his body before our judges at Union Town at our county court of common pleas there to be held for the county of Fayette the second Monday of September next to answer unto Benjamin Barefoot of a plea of trespass on the case**. And have you then serve this writ. Witness Nathaniel Briading Esquire at Union Town the twelfth day of June in the year of our Lord one thousand eight hundred. ** “trespass on the case” :From Black's Law Dictionary, Revised 4th Edition: Trespass on the case: The form of action, at common law, adapted to the recovery of damages for some injury resulting to a party from the wrongful act of another, unaccompanied by direct or immediate force, or which is the indirect or secondary consequence of defendant's act. Commonly called, by abbreviation, "Case." Sir:/ Archibald Coone and I hav(e) settled our acct. and you wo(u)ld be so kind as not to serve the rit, and you will oblidge your humble servt Benj’m Barefoot June 25, 1800 W. Steward Sheriff"
After 25 June 1800, Benjamin is never heard of again. While some claim that Benjamin died in 1839 and was buried in Lancaster County, he does not appear in any subsequent censuses, so one could reasonably assume that he died prior to 1810, around the age of 45. Another mystery remains. Researchers have been unable to find Benjamin enrolled in any medical school of the time; yet traditionally “Dr.” Benjamin Barefoot persists. Did he perhaps, as a blacksmith, pull teeth on the side as so many blacksmiths of the time did? Did he attain the name “Dr.” because of performing lay dentistry? Not enough is known about him to provide concrete information about the title. We do know that Rebecca was left in Berks County. Her father James Ross had died prior to 1798, so Rebecca with children James (b. 1788), William (b. 1791), Samuel (b. 1793), Ezibella (b. 1795), and Job Palmer (b. 1798) made a home with their widowed grandmother Ruth Robinson Ross while Benjamin was absent. It is also significant that in 1809 Rebecca took a job at the Joanna Furnace, probably to support her family. Her employment along with the fact that she never had any other children after Job Palmer also suggest that she was not with her husband. 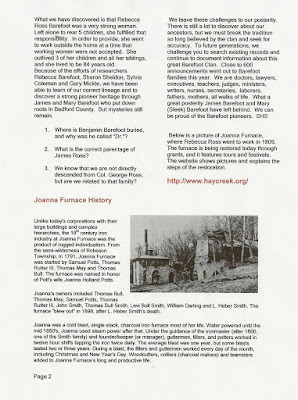 A visit to Joanna Furnace recently (2007) by clansman Attorney Bill Krieger led to a discovery of a spacious kitchen on the premises; the present caretakers of the furnace feel that Rebecca worked as a cook rather than working within the iron production itself. Meanwhile, back in Berks County, Benjamin’s wife Rebecca is listed as the head of the house by 1810. Rebecca's family also listed her as a spinster at the time of her death. Tradition claims that Benjamin Barefoot died in 1839 and was buried in the Leacock Presbyterian Cemetery east of Reading, PA. While there are Barefoots buried there, no recent visitors have been able to find Benjamin’s gravesite. My husband and I (Jack and Sylvia Sonneborn) walked all over the cemetery and looked at each tombstone, and the only ones we could find did not include Benjamin. Researcher Sharon Sheldon feels that his body would not have been taken from Fayette to Berks County for burial by horse and wagon at this time. Most researchers suspect that he died much earlier, perhaps at the time that Rebecca went to work in 1809. Her employment also coincides with the departure of her eldest son James Barefoot (age 21) to Bedford County, PA. Why did James go to Bedford County in 1810? If Benjamin had died around 1809, and the family no longer had support money or letters being sent from their father, would James have headed to Western Pennsylvania to find his father? If Benjamin were alive, could he just have headed West to see him? It seems strange that James would leave his mother behind with 4 children and not take a job in Berks County to help support his younger siblings. Of course his brother William would have been 18 and could have helped by becoming employed. Whether James was sent to find his father or whether he succumbed to the wanderlust of a robust young man, James settled in Bedford County. In 1810, James married Mary Sleek of Frederick, Maryland. Together they reared 12 children, our individual ancestors. Life must have been difficult for James' mother Rebecca. She lost many loved ones during her lifetime. Her mother Ruth Ross died in 1813-15; her son Samuel died in 1814 at the age of 21. Rebecca probably was cared for by her brother William until he died in 1818 at age 46. It was also that year that her second son William married Mary Sheaffer and eventually moved to Mifflin County. Ezibella married Daniel Rutter in 1819 and eventually moved to Ohio. By 1825 her last child Job Palmer married Agnes McCasky but stayed in the Lancaster area. Rebecca Ross Barefoot's sisters also died - Margaret in 1831 and Mary Ann in 1834. Most of the people she loved died or moved away. Were these the circumstances that motivated her to seek the companionship of her eldest son James and his wife Mary in Bedford County? She left her youngest son behind and made the long journey from Berks to Bedford County to live with James and Mary Barefoot. We can guess at the time period. In 1840 her son James appears on the Bedford County census without Rebecca. Then he died in 1844, so one would assume that Rebecca arrived prior to his death. For whatever reason, this is the place where she spent her last days, more than likely living in the home of her daughter-in-law Mary or one of her grandchildren. 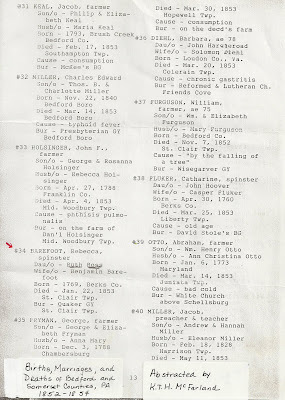 Rebecca died on 22 January 1853, in Bedford County, Pennsylvania, and on her death certificate, filled out by her grandson William, she is listed as a spinster, her father’s name is left blank, and her mother is listed as Ruth Ross. It seems unusual that her grandchildren did not even know the name James Ross, Rebecca's father, but they had been born in Bedford County, and any history from Berks County may never have reached their ears or at least had not been recorded. Rebecca and her son James were buried next to each other in the Quaker Cemetery in East St. Clair Township, Bedford County, Pennsylvania.